Today was the Homeless Congress meeting which is our monthly check in with homeless people. We had a pretty full crowd with 30 homeless and formerly homeless people and a number of social service providers. We had the County staff presentation as well as County Councilman Dale Miller attending the meeting to watch. Ramona will have a fuller picture on the meeting when when she finishes the notes especially the discussion about timelimits for the shelter. The big issue was the contract currently being considered by the County over management of the Women's Shelter. There are two competing proposals to administer the Women's Shelter. Ruth Gillett of the Office of Homeless Services answered many questions about the process. She said that there was a County representative, two members of Ohio Jobs and Family Services, City of Cleveland, ADAMHS Board representation, United Way, and a local foundation who will make the decision over the next few weeks. There was some concern expressed by some residents or former residents about the fairness of the process. They questioned Gillett about the makeup of the committee and will these individuals be able to see past what is written on paper to what is or has gone on at the shelter for the past 10 years. We have documented the many problems expressed by the women over the last few years. We have laid out potential solutions, but we are clear that NEOCH believes that there needs to be a change in providers. Frontline Services is a fine organization that we work with closely on outreach and management of most of the permanent supportive housing programs, but we believe that they do not understand how to administer an entry shelter for single women. It just has not worked and the length of stay and overall rise in the numbers of women at the facility shows the extent of the problem with the existing social service provider. The women are stuck and there is no where to go. NEOCH's only goal here is to make sure that conditions improve for single women who find themselves without housing. We believe that the County needs to look for a new provider, new ideas, and a new strategy for providing a quality service to homeless women. I expressed reservations to the residents of the shelter in arguing balls and strikes about the process or the umpires who will decide who gets the contract at the Homeless Congress meeting. 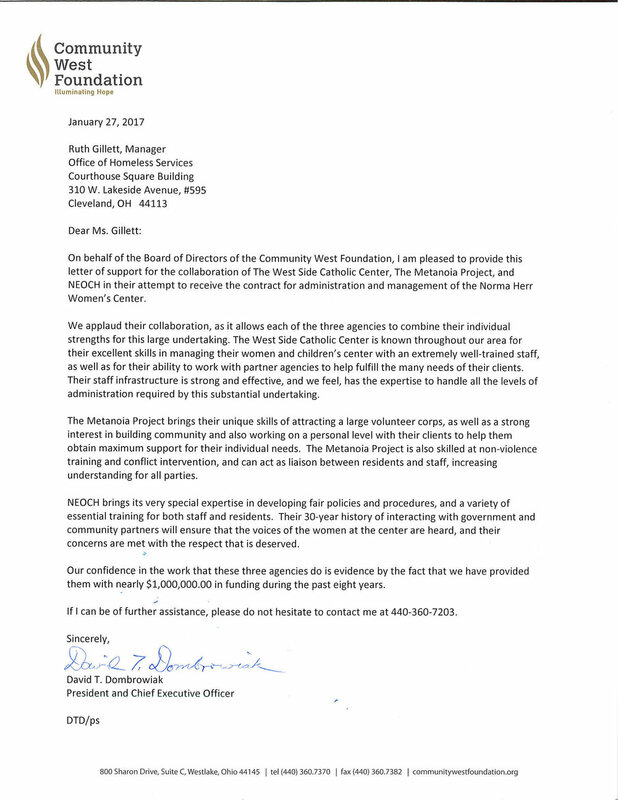 The County did give more time for the applications and gave extra time for any transition that might take place which were requested by both the women living at the shelter and by NEOCH. The County has tried to set up a fair process that gives both sides an equal shot at the contract. We should not question the independence or impugn the integrity of those who will make the decision on who will run the shelter. These are all people who spend much of their days looking at proposals and ferreting out quality programs in grant requests. In my opinion, anyone working or who had previous experience with homelessness would be biased and would have good or bad experiences with specific staff or one of the programs seeking funds. It would be like putting an employee of a guy standing trial for theft in the jury pool. We trust the process and hope that committee sees the need for a change locally.